CLIFTON, NJ – Three incredibly successful June fundraising events have propelled the Cure Breast Cancer Foundation, Inc. (CBCF) past the impressive mark of $5 million raised to support breast cancer research and the work of Dr. Larry Norton and colleagues at Memorial Sloan-Kettering Cancer Center and other national and international research facilities. 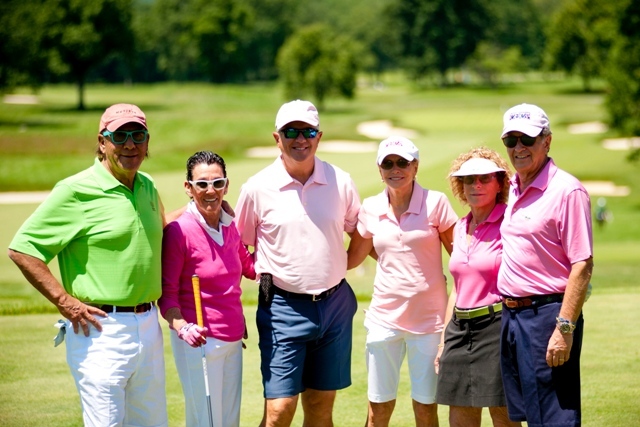 Highlighting June’s schedule of events was the 7th Annual Golf Classic, one of the signature yearly outings hosted by CBCF. Held in West Caldwell, N.J. at the Mountain Ridge Country Club, site of the USGA 2012 Senior Amateur Championship, the 2014 MGA Mid-Amateur Championship and one of Golf Week’s “Top 100 Classic Courses in America,” the 2014 Golf Classic raised $550,000. The day-long event featured a $1 Million Hole-In-One Shootout and raffle drawing for a 2014 Chevy Camaro convertible. The festivities concluded with a dinner reception where the Foundation’s Scientific Advisor, Dr. Larry Norton, along with a panel of doctors, including Dr. Elizabeth Comen, Dr. Shari Goldfarb and Dr. Phillip Paty from Memorial Sloan-Kettering Cancer Center addressed guests, as well as a heartwarming and emotional speech by Erin Gabrielson, Chair of the CBCF Junior Board and breast cancer survivor. The Golf Classic was preceded in early June by a three-day shopping event held in conjunction with Bloomingdale’s in the Mall at Short Hills in Short Hills, NJ which raised more than $7,600. CBCF and the nationally-recognized retailer joined together for the fundraising effort which featured a fashion show highlighting the latest designs and trends and a special panel discussion with Dr. Serena Chen of St. Barnabas and Dr. Shari Goldfarb of Memorial Sloan-Kettering Cancer Center, as well as Jennifer Finkelstein, a breast cancer survivor and founder of 5 Under 40, and Leah Feldman, who carries the BRCA gene. Bloomingdale’s in the Mall at Short Hills donated $3,000 to CBCF along with 10% of all sales from the weekend event. On June 21st, the Sole-stice Sprint 5K took place in Verona Park in Verona, N.J. raising more than $4,000 to benefit the Cure Breast Cancer Foundation. CBCF is directly responsible for and is actively supporting through its fundraising two important research projects – breast cancer and its microenvironment and bone metabolism and breast cancer. All this work is coordinated by Dr. Norton, CBCF’s scientific advisor, who is leading the fight against breast cancer with groundbreaking work that addresses cases when the disease spreads to other parts of the body where it can currently be controlled, but rarely cured. The Cure Breast Cancer Foundation (CBCF) is a Clifton, N.J. – based not-for-profit 501(c) (3) charity devoted to fund research on the growth and spreading of breast cancer cells, also known as the Self-Seeding Theory, at the Memorial Sloan-Kettering Cancer Center in Manhattan and other national and international cancer research facilities under the direction of Dr. Larry Norton, who serves as the Foundation’s Scientific Advisor. The founder and president is Carly Abramson. Her father, Andrew Abramson, is Treasurer. For more information, call (973) 471-CBCF (2223), e-mail info@curebreastcancerfoundation.org or visit http://www.curebreastcancerfoundation.org/.